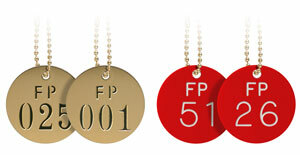 Mark your fire system valves or sprinkler system valves with your choice of either brass sprinkler valve tags or engraved plastic fire protection tags. Sprinkler ID Tags by PipeMarker.com allow personnel to quickly and easily identify the location of your facility’s sprinkler system valves. Tags are in stock and ready to ship. 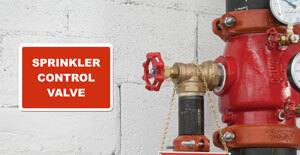 PipeMarker.com offers a large array of NFPA compliant Fire Sprinkler System Signs that identify your facility’s sprinkler systems and its main components. Manufactured from durable Rust-Free aluminum, your new Fire Sprinkler System sign is perfect for a number of areas and conditions. 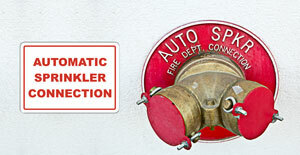 NFPA compliant Fire Connection Signs by PipeMarker.com are designed to help emergency responders identify the location of your facility’s fire department connection. Fire Connection Signs feature bold text that is easy to read and are constructed from durable materials that last for years. NFPA compliant Sprinkler Room Signs by PipeMarker.com help personnel and emergency responders quickly and easily identify where your sprinkler system controls are located. 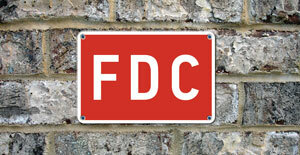 These Fire Sprinkler Room Signs are manufactured from durable materials that help your sign last for years. 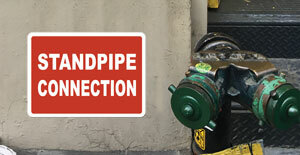 PipeMarker.com’s Standpipe Signs are designed identify standpipe connections as well as specific information about your facility’s standpipe system. They are available with a variety of wording combinations to further identify specifics of the system and to meet the requirements of NFPA 13. 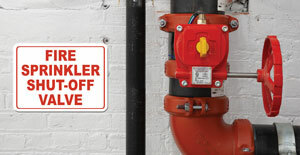 PipeMarker.com’s Valve Shut-Off Signs are designed to quickly and easily identify the location of your sprinkler system’s shut-off valves. 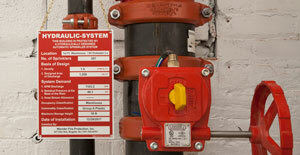 They are available with a variety of wording combinations to meet the signing requirements of NFPA 13. Sprinkler Valve Signs by PipeMarker.com are designed to help personnel quickly and easily identify the location of your sprinkler system’s valves. These Fire Sprinkler Valve Signs are available with a variety of symbols and wording combinations to meet the signing requirements of the NFPA. 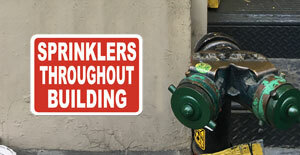 PipeMarker.com’s Automatic Sprinkler Signs are designed to provide information about the sprinkler system and its components to personnel and emergency responders. They are available with a variety of wording combinations to meet the signing requirements of NFPA 13. NFPA 170 symbol signs are also available. 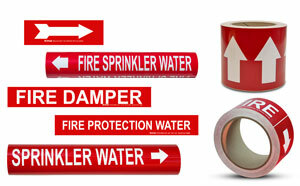 PipeMarker.com’s Fire Sprinkler Identification Signs are designed to provide information about the sprinkler system and its components to personnel and emergency responders. 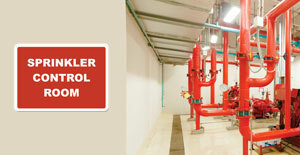 They are available with a variety of wording combinations to meet the signing requirements of NFPA 13. NFPA 170 symbol signs are also available.